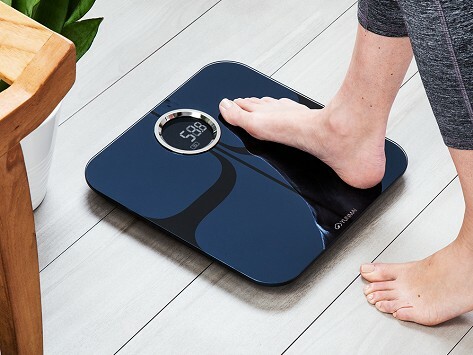 The Bluetooth Yunmai premium smart scale gives you big-picture health information beyond weight. Bioelectric Impedance Analysis (where a safe electrical current is sent through the body) measures health metrics like body age, BMI, hydration and more, and stores it all in the app. Here you can track changes, check healthy benchmarks, set goals, and sync with other fitness and health apps. Dimensions: 12.9 " x 12.9 " x 1.2"
Great look, great app, great information! It gives great information. Sometimes I don’t like the information it tells me but it’s still an excellent scale! Both my husband and I are losing weight. It’s really a great idea to track all functions, so we know we are doing it properly. Easy to set up and links to your smartphone or tablet for tracking stats. Fun to use and a good tool for dieting and overall general health.